Claud W. Beelman (1883 – January 30, 1963), sometimes known as Claude Beelman, was an American architect who designed many examples of Beaux-Arts, Art Deco, and Streamline Moderne style buildings. Many of his buildings are listed on the National Register of Historic Places. Beelman was married to Lourene Taft Beelman (b. 1883, Ohio - d. 1948, Ca.). In 1910, he was a draftsman in the state of Indiana. (Cite: U.S. Census Records, State of Indiana, 1910.) It was there they had a daughter, Helen Beelman (b. 1912). By the 1920s, the family had relocated to Los Angeles, and by 1930, they lived in Beverly Hills. From the 1920s on, Beelman, as partner or owner of one or another of several firms (Curlett + Beelman; Allison & Allison; Ruck & Beelman; Claud Beelman & Associates) designed a number of prominent civic and private structures. By 1956, Claude Beelman & Associates officed at 7421 Beverly Blvd., Los Angeles 90036. When he was in his seventies, Beelman designed the 12-story Superior Oil building for oil tycoon W.M. Keck. Completed in 1955, the Superior Oil building later became The Bank of California Building, and was used for the bank's offices until the 1980s. By the late 1990s the building had been vacant for nearly ten years, but has been renovated beginning in 2000 by hotel developer Andre Balazs, and now is the location of his hotel The Standard. 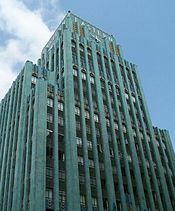 It is the zig-zag moderne Eastern Columbia Building, however, with its facade of turquoise green terra cotta tile, ornate clock tower, art deco lighting, fixtures, signage and architectural detail that is Beelman's most recognizable work. In 2006, the Eastern Columbia Building was converted from office space to loft live/work spaces by the Kor Group and is now one of the most desirable loft buildings in Downtown Los Angeles. ^ "The Standard Hotel Site". ^ "The Los Angeles Times: "Rooms with a 'Mod' View" (PDF file)" (PDF). "The Cooper Arms - A Brief History". Arnold Schwartzman, Bevis Hillier (2005-08-11). Deco Landmarks: Art Deco Gems of Los Angeles. Chronicle Books. ISBN 0-8118-4601-6. "Los Angeles Downtown News - Los Angeles Downtown Visitor's Guilde - Architecture". "LA Time Machine - Historic Buildings in LA". "Sony Pictures Museum - Thalberg History". "Contemporary Fresco Gazette: Park Plaza Hotel - New Time, New Life". "The Larchmont Chronicle: Classic Apartment Buildings - The Talmadge". "The City of Long Beach - Historic Landmarks". "Downtown LA - Office Space: The Jewelry Center, and others". 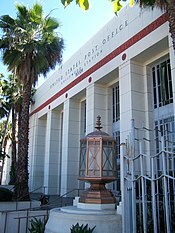 "The Hollywood, CA Post Office". "History California: US Post Office -- Hollywood Station". "Public Art in LA - Downtown / Broadway: 9th & Broadway". "Long Beach: Historical Beaches and Places". "Blogdowntown.com: "What is LA's Oldest Parking Structure?" - (Re: May Company Garage, 1926)". "Los Angeles Conservancy - 9th & Broadway Building". "Curbed LA: Roosevelt Building Gets Lofted". "Ancestry.com: 1930 Federal Census Bureau Record, City of Beverly Hills: District 19-822, Supervisor District 16, Sheet 15B, Claud Beelman, Architect". "LeConte, Hollywood - 1926: Helen Beelman". "L.A. Public Library Photo Database: Claud Beelman's Rose Hill, Hollywood Post Office, and other Federal and municipal public works (Search Photo Data base: Claude or Claud Beelman if link becomes inoperative)". "Avery Architectural & Fine Arts Library: Greene & Greene Collection - Pacific Southwest Trust & Savings Building, Pasadena, CA, Job No. 476, from 1924, 1926, (Original Hand Drawings online of Beelman's)". "The Eastern Columbia Loft Site". "The Wilshire Center: "Wilshire Corridor History" (Cites many of Beelman's early works)". Archived from the original on 2008-05-11. "Services for Architect Claud Beelman Set", Los Angeles Times, February 2, 1963 Part II, page 6.